I want to do something a little different with this column and review a single book with the depth and breadth I feel it deserves at this particular moment. 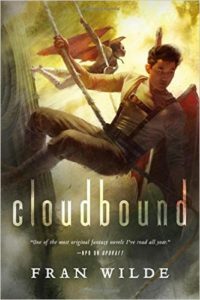 There will be spoilers for Fran Wilde’s Updraft, but I’ll try to discuss Cloudbound without getting into any. If you’d prefer to avoid the possibility of any spoilers at all, know that I absolutely unambiguously recommend both these books, and you should go read them immediately: they’re beautifully written love letters to engineering, and full of some of the most wildly imaginative world-building I’ve read in years. Updraft introduced us to a city far above the clouds, made up of living bone towers between which people travel—at great personal risk—on mechanical wings. These towers surround a central Spire, where the ruling elite, called Singers, jealously guard the city’s history and specialised knowledge of flying: how to fly at night, how to echolocate, how to shout down the monsters invisible until they open their mouths to consume you. By the end of Updraft, Kirit Densira has led a revolt against the Singers from within the Spire and upended her city’s generations-old order, with the nagging question of what are the bones growing from forming a potent undercurrent to the book’s concerns about population control and futurity. Cloudbound begins a few months later, picking up the city’s pieces: what’s to be done with the Singers who fought against oligarchy from within, but were often complicit in the Spire’s horrors? What’s to be done with the children (called “fledges”) being raised in the Spire, innocent of its crimes? What’s to be done to stitch the city’s fabric back together before it succumbs to gravity? Who will fill the vacuum of authority in a city that has only remained aloft through the most intricate and precise checks and balances of social and physical engineering? Narrated by Kirit’s friend Nat, sibling-close and of very different temperament, the answers to these questions aren’t obvious. Where Kirit is fierce and impassioned, Nat is cautious and quiet; where Kirit leads, Nat is led; where Kirit forges forward alone for the good of the city, Nat is constrained by the bounds of his family and devotion to the letter of Laws over their spirit. It’s a choice I’ve seen held against the book by other reviews, but that I’d argue is not only appropriate, but necessary to the book and series’ central concerns. In Cloudbound the villain is no longer secrecy, but disinformation; no longer oligarchy, but demagoguery. In a world where new laws and information are written on bone chips and disseminated by birds, it is the strength and viciousness of the birds in question that win out, not the validity of the information being spread. The helplessness in the face of being unable to communicate with one’s fellow citizens is palpable and painfully familiar; the desperate need to be heard and understood is sharpened by the impossibility of reaching through the layers of anger and fear separating the towers from each other. In Updraft, Kirit’s voice could stop monsters; in Cloudbound, monsters strangle Nat’s voice, and the only hope of rescue is buried deep in half-remembered songs that must be rebuilt between family and friends. Cloudbound is, in many ways, a book about how difficult and crucial it is to organize and communicate in the face of those who’d twist laws and language to their own ends. The timeliness of this book staggers me. It was written and published before media narratives around false news had really solidified, before “post-fact society” became as common a phrase as it presently is. I finished reading it before November 8th; after November 8th I felt I’d read a different book. At a time when every few hours I see people questioning what good is art in the face of fascism, asking how they can promote their work in the face of proposed Muslim registries and citing of Japanese internment camps as precedent, Cloudbound’s wedding of law, memory, and history to song is overwhelmingly relevant. I have a bone—as it were—to pick with this review of the book, which suggested that “Updraft . . . soars in a way Cloudbound doesn’t . . . partly because revolutions are glamorous, and rebuilding is not.” This is a false binary. Revolutions are only glamorous in retrospect, once the difficult work of rebuilding has been accomplished. To separate revolution from rebuilding, and to fault the latter for lacking the energy and fierceness of the former, is a dangerous category error—and given the world in which we find ourselves this winter, I am deeply grateful for books that don’t shy from depicting the visceral complexity of building something up in the wake of one’s world being torn down. Where Updraft moved horizontally through its society to get to the Spire’s marrow, Cloudbound moves vertically through space and time to get at cultural memory and the city’s origins, excavating history out of damp, cloudy air. I see in it our own concerns about climate change, the skeletal outlines of narratives around saving our planet or abandoning it, the agonizing work of making bridges between people, whether of sinew, silk, or—more challenging than either of these—words. A middle book is a kind of bridge, too. Between the unburied certainties of Updraft and the undiscovered country of next year’s Horizon are Cloudbound’s hard and necessary questions—and the suggestion that asking them together, of each other, is fully as important as the prospect of finding answers.